Rent our Venue for any Event! View our various event rental types below. The prices stated are not fixed and may vary depending on your individual circumstances. For more information, please feel free to call or message us. Celebrations like wedding receptions going past 10:00 pm. You’re required to rent at least 50% of our rooms at very discounted rates. (Reason: Venue is not sound proof which affects the sleep of hotel guests Closing off entire hotel would result in a loss). 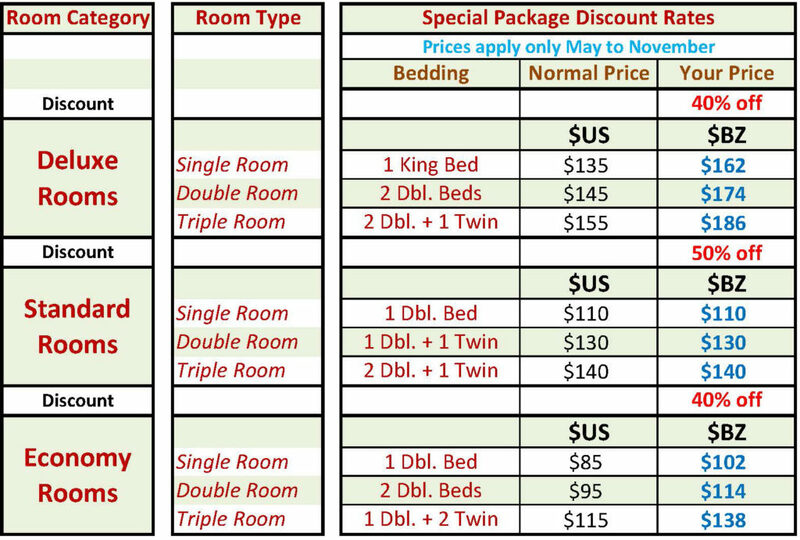 Please view special package rates with up to 50% discount below. A 35% discount is available on Deluxe & Economy rooms & a 40% off on Standard rooms for your out-district or foreign invitees. Venue is only available during low season – May 1st to 15th December (& except during July). Additional seats & tables must be rented to accommodate larger guest numbers. A 50% of venue rental cost is required to reserve the venue. You have exclusive use of the venue from 1:00 pm until 3:30 am. You’re allowed venue decorations from the night before onto the morning of the event. FOOD: For wedding or big celebrations, you may choose to hire our in-house catering services (at a package deal) or you may hire your own external caterer. DRINKS: Bring your own drinks (beers & liquor), & we cool them in our fridges & serve them. Based on years of experience, we don’t recommend draft beer (kegs) they are wasteful and messy. Our in-house staff MUST maintain a presence within & operate our bar. There are many controls & utilities which can only be operated by management/ staff. PARKING: Cost includes a parking director. Our parking is limited & requires guidance in order to ensure maximum use of space and ease of traffic flow. It makes life easier for all. SERVERS: Our servers are limited and often time they would be stationed within the bar(s) as we have two bars for faster service. If you wish to hire your own servers to service your guests at their tables then you are free to do so. 50% of the total venue rental must be paid minimum 3 months prior to the event date. The balance is due 1 day before the event date. Venue rental cancellations within 3 months or more, receive a 100% refund. Cancellations under 3 months receive a 50% refund. Cancellations within 2 weeks or less receive a 25% refund. 50% of total rooms must be paid minimum 3 months prior to event date. The balance is due 1 day before the event date. Cancellations 90 days or less prior to event date receive 100% refund less 4% processing fee Cancellations within 30 days prior to event receive 50% refund. Cancellations later than 30 days receive no refund. Below are our Special Package Discounted Rates for your guests. A VIP Customer Service Event is any event not requiring music for celebration (band or DJ). Examples: Staff gatherings, Birthday dinner/ lunch gatherings, family gatherings, etc. No extra fees apply for special arrangements or basic decorations (balloons). Perfect for family or friends wishing to treat their loved ones to a nice locations for dinner or lunch. This type of event cannot go beyond 10:00pm. A special pool fee discount may be granted for groups of 15 or more. We require that you purchase your food and beverages from us. No outside foods are allowed. For birthdays, you are allowed to bring your own birthday cake or cupcakes. You must confirm your menu options minimum 3 days before the event & deposit 50% of food cost. 50% of the total food cost must be deposited minimum 3 days prior to the event (for large groups). The balance is due on the day of the event date. Food deposit is non-refundable within 3 days of the event. You even get a free (local) drink of your choice, that’s our gift to you. Birthday celebrants also receive a free pool pass if they’re accompanied by at least 4 others. You may choose to bring your own cake or you may have us arrange that for you. Choose which setting you prefer: Indoors Restaurant, Outdoors Deck, or Poolbar terrace. There are no extra fees for special arrangements (balloon decorations & table setup). If you wish to have a specific theme or wish to bring your own decorations, you may feel free to do so. We also do romantic candle-lit Dinners or any other milestone celebration like anniversaries or Christenings. The birthday celebrant must be accompanied by a minimum of 4 other persons who will also be having dinner or lunch (each person purchasing a separate meal – you do not qualify if you all will be sharing a pizza or sharing meals). Meals must be pre-ordered to ensure availability and a down payment must be made to secure your reservation. Outside food (apart from a cake) or drinks are not allowed. A reservation must be made by phone, email, or private message at least a day before the event. It does not have to be your exact birthdate (but should be near) to qualify, however; you must meet the minimum additional 4-persons & meal-orders requirements stated here-in. Additional service charges may apply, depending on number in party. A VIP Customer Service Event is any event which does not require extra servers, or music for celebration (band or DJ). This includes staff outings, birthday dinners/ lunch, family outing, etc. We don’t charge any extra fees for special seating arrangements or basic decorations (balloons). If you have any such group outings and are looking for a location to gather with your friends, staff or loved ones, we’d be happy to host you free of cost, provided you are purchasing food and beverages from us. This type of event cannot go past 10:00pm. A special pool cover discount may be granted for groups of 15 and over. A Mini-Celebration event is no more than 50 persons who require a venue for celebration purposes with requirement for extra servers, toiletries, utilities & possibly music. 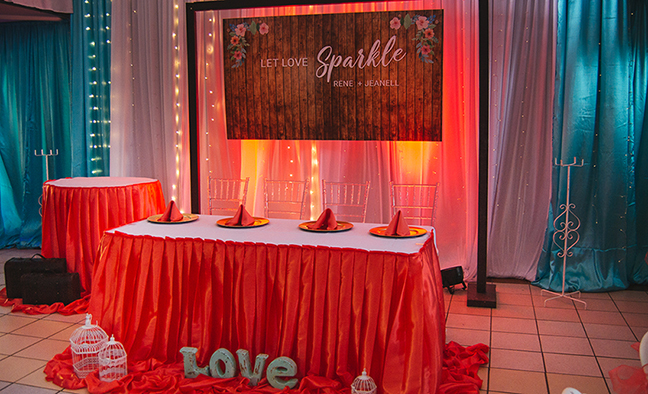 This type of event sees clients inviting their own guests to their mini celebration such as baby shower, graduation party, class reunion, anniversary, etc. Apart from a special seating arrangement, we designate our events venue or an area for your use although outside guests & customers are allowed within the venue area that you are not using. This group size normally requires extra use of toiletries, utilities, & servers. Depending on group size and demand, an additional service charge may apply. You are required to purchase food & beverages from us at a packaged deal. Depending on your group size and demands, a custom service charge may apply. While there is no cost for use of venue, you must pay a deposit on food orders in advance. 50% of the total food cost must be deposited minimum 1 week prior to the event (for large groups). The balance is due on the day of the event date. 50% refund is due for cancellations within a week from the event. No refund is due for cancellations 3 days or less from the event date. Workshops, seminars or worship sessions are events that require a special seating arrangement and are not for celebration purposes. These events can last all day long or half day but don’t normally go up until the night (in which case additional fees may apply). There is no cost for use of venue. However, depending on group size and demand for toiletries, servers, etc, an additional service charge may apply. This fee must be paid in advance to reserve he venue. Depending on the size of your group and their demand, an additional service charge may apply if additional servers are required. Food and beverage must be purchased from us. 50% of the total food cost must be deposited minimum 1 week prior to the event (for large groups). The balance is due on the day of the event date.